Kimberli Moffitt-Tsui’s 8′ by 12′ Modern-Shed home office. SAN BRUNO — As a photographer who works from home and a mom of three kids, Kimberli seldom found the right space to complete her projects. Kimberli and her husband live in a small home in the San Francisco Bay area, where most of the houses aren’t big, “unless you have millions of dollars to spend,” Kimberli said. The couple considered adding onto their home, although the high cost of doing so prevented them from pursuing that option. When Kimberli’s husband suggested they erect a building in their backyard, Kimberli knew exactly what she wanted. 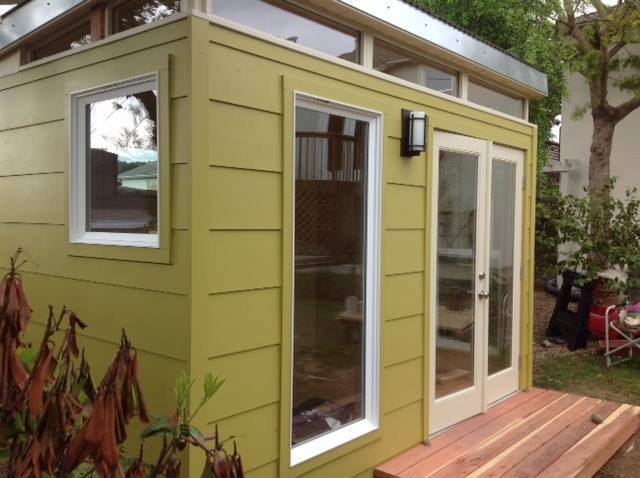 Kimberli chose an 8′ by 12′ Modern-Shed based on the size she had available in her backyard. In less than three days, Kimberli’s Modern-Shed home office went up. In less than three days, Kimberli’s Modern-Shed was up, and she was impressed with the quality of the construction. 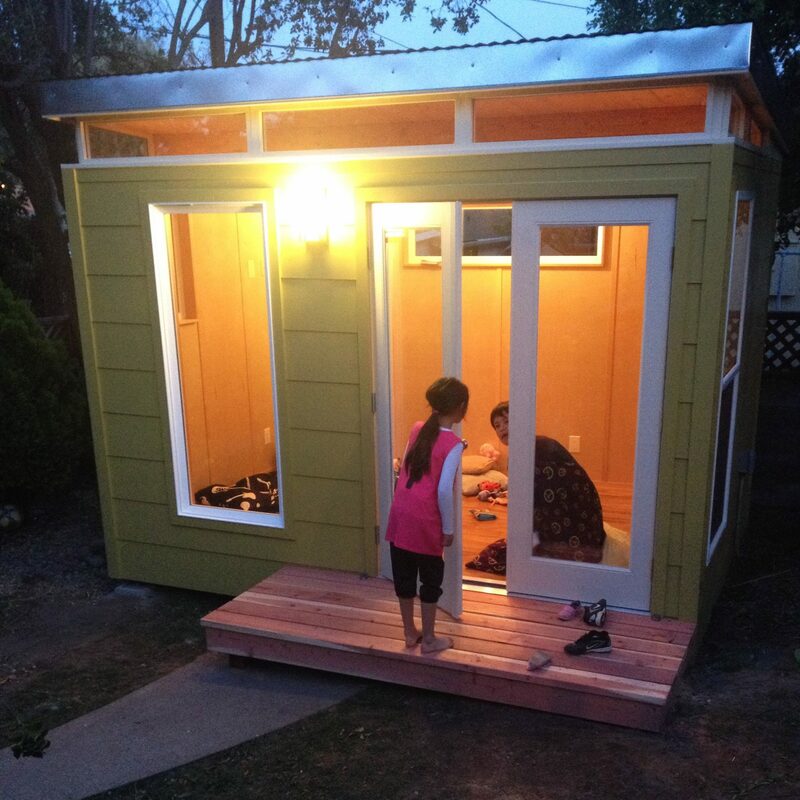 While Kimberli has yet to set up her home office, her children — 6, 8 and 9 years old — have already been enjoying the Modern-Shed. Kimberli’s children enjoy watching movies in the Modern-Shed. Kimberli’s friends and neighbors have been impressed as well. Kimberli’s children love to play in her new Modern-Shed. Kimberli’s husband set up a television in Kimberli’s Modern-Shed. 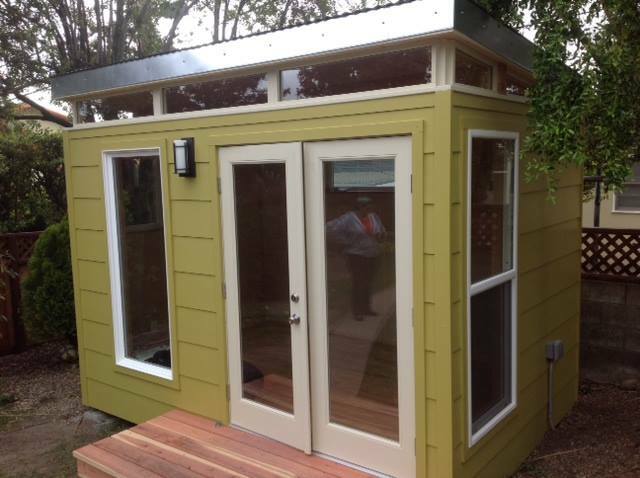 Kimberli’s Modern-Shed lets a lot of natural light in. Kimberli’s daughter enjoys playing in the Modern-Shed home office. hi kimberli, great addition to the home! Now my wife wants one…I’m in trouble…cheers!